Although many users are using Windows 10, it seems that some users are having certain issues. Speaking of which, Windows 10 users are reporting that they are getting Failed to play test tone message, so let’s see if we can fix that. Conexant Audio, Sound Blaster, IDT, Realtek Audio failed to play test tone – According to users, this error usually appears with IDT or Realtek audio devices. The issue is usually caused by outdated driver and it can be easily fixed. USB audio failed to play test tone – If you’re getting this error, it might be because you’re using a USB sound card or USB headphones. According to users, the problem occurs more often with USB audio devices. 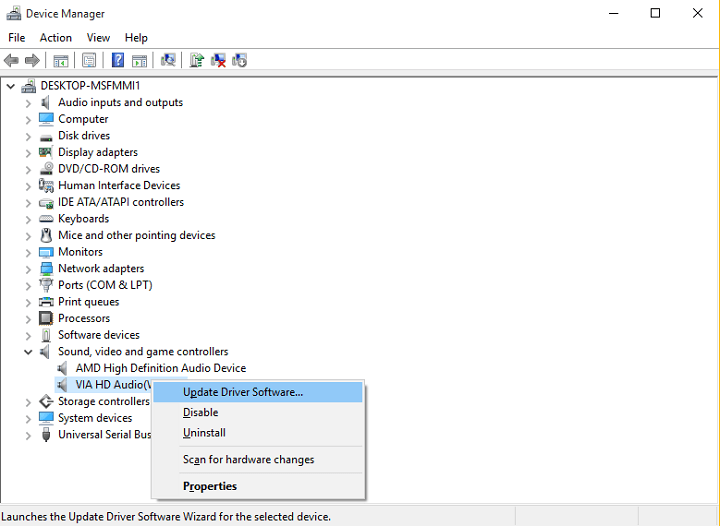 AMD HDMI audio failed to play test tone – Sometimes your graphics card drivers can install audio drivers as well. Users reported this error message when using HDMI cable with an AMD graphics card. 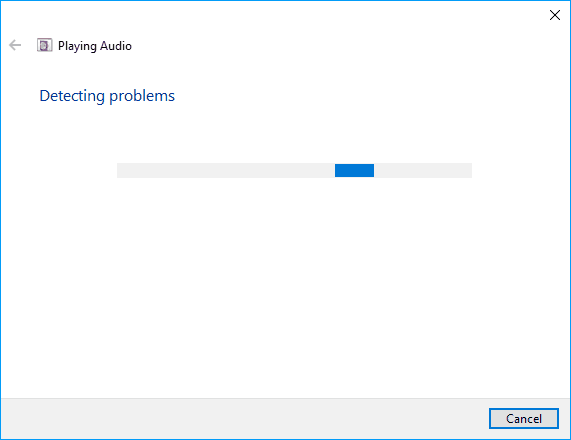 Dell, HP audio failed to play test tone – Audio problems such as this one can occur on almost any PC, and both Dell and HP users reported this problem on their devices. Laptop no sound, failed to play test tone – This issue affects both desktop and laptops PCs alike. In fact, the issue is more common on certain laptops than on desktop PCs. Sound card failed to play test tone – If you’re having this problem on your PC, you might want to know that it can affect almost any sound card. According to users, both dedicated and built-in sound cards are affected by this issue. Sound failed to access device – This is another variation of this error, and if you have it on your PC, you should be able to fix it by using one of our solutions. Failed to play sound, sound disabled – In some cases you won’t be able to play any sounds on your PC. 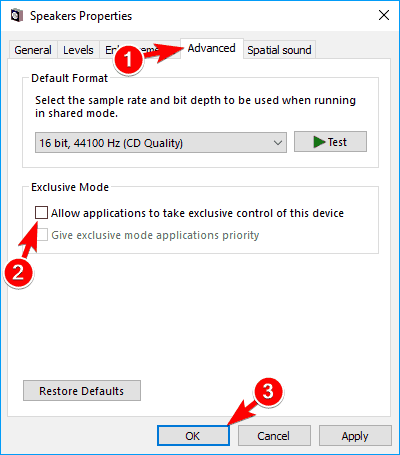 According to users, the sound can become completely disabled on your PC due to this problem. 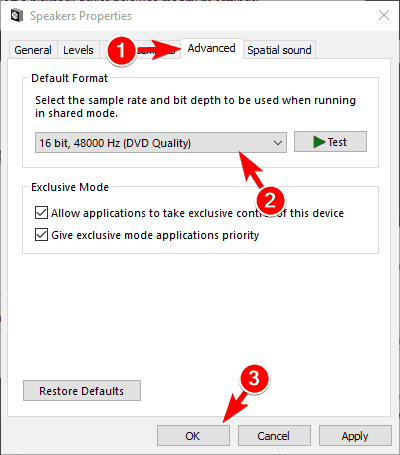 Unable to play sound on laptop – This problem affects both desktop and laptop PCs alike. This is a serious problem, and many users reported that they are unable to play any sound on their laptop. Before we start solving this issue, we would advise you to update your Windows 10 with latest patches. Some users report that Microsoft has fixed this issue so make sure that you keep your Windows 10 up to date with latest updates. If downloading the latest updates doesn’t work and you still have this problem you can try the following solutions. 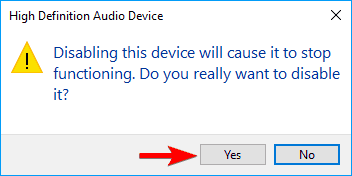 Users report that when upgrading to Windows 10 their speaker settings change to Quadraphonic. 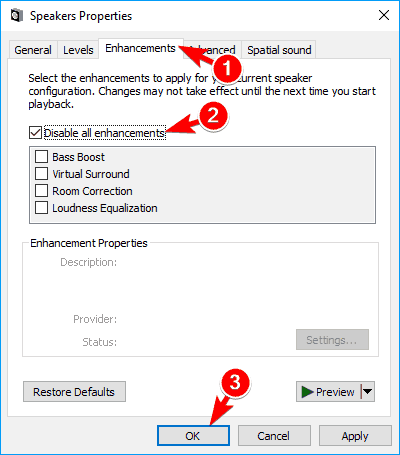 If you’re using 5.1 speaker system, go to your speaker settings and change them from Quadraphonic to 5.1. 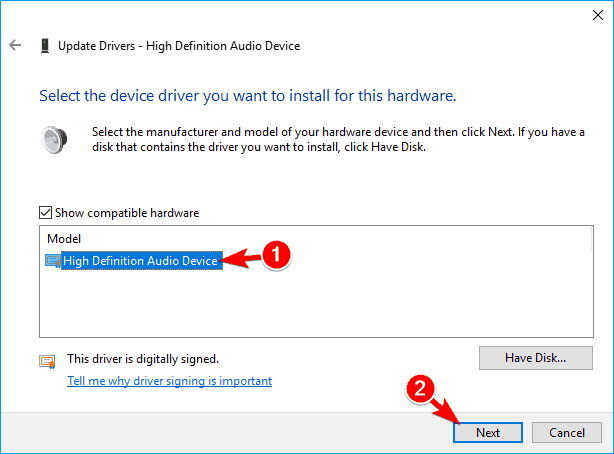 Go to Device Manager and locate your audio driver. Right click it, and choose Uninstall. After the driver has been uninstalled press Search for new hardware button. This will install the default audio driver. There are many versions of sound drivers, so select the appropriate version and then download and install it. This can be a long process, especially if you do it manually. 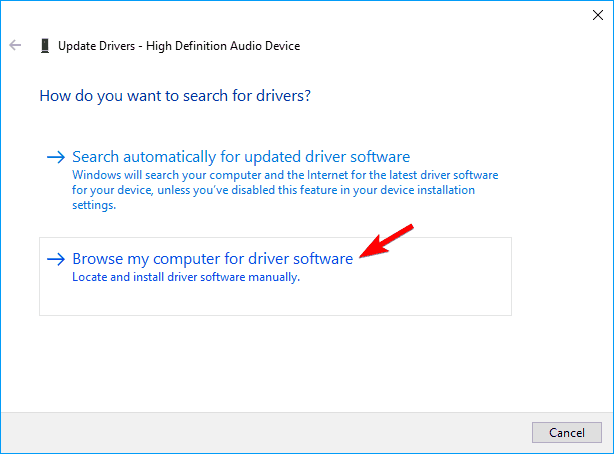 Get now DriverFix (100% Windows 10 compatible) to do it automatically. This tool will help you to avoid permanent damage to your PC by downloading and installing the wrong driver versions. 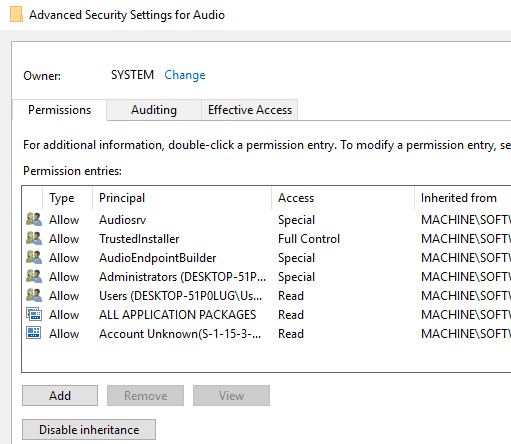 Go to the Device Manager and find your audio driver. Right click it and choose Update driver. Choose Browse my computer for driver software option. Now choose Let me pick from a list of device drivers on my computer. In the list of drivers choose High Definition Audio Device. Click Next and if you get a warning choose Yes. 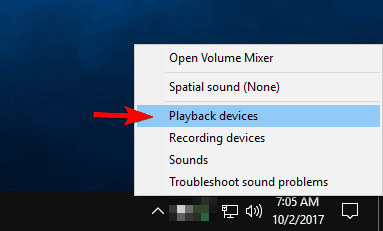 Right click the volume icon in your sysbar and choose Playback devices from the menu. When Sound window opens, make sure that your speakers or headphones are set as the default device. 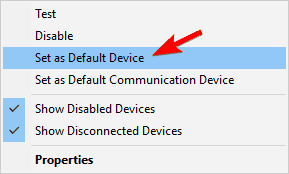 If not, you can set them by right clicking the device and choosing Set as default device from the menu. Select your audio device and click on Properties. When Properties window opens, navigate to Advanced tab. Now in the Default Format section select a different audio format. Click on Apply and OK to save changes. After doing that, check if your sound is working properly. Many users reported that this solution fixed the problem for them, so be sure to try it out. Keep in mind that you’ll have to try using several different formats before you find the one that works for you. 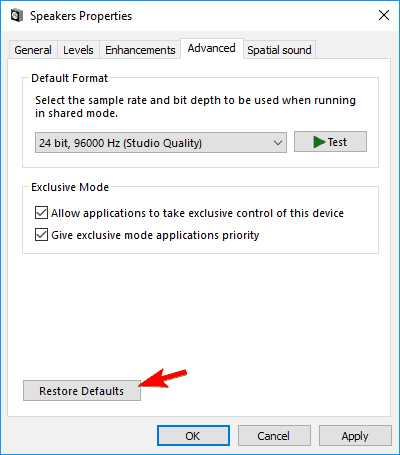 If changing the format doesn’t work, several users are recommending to click Restore Default button to restore your audio settings to original values. Open Speaker Properties. We showed you how to do that in the previous solution, so check if for additional information. Navigate to the Enhancements tab and check Disable all enhancements. Click on Apply and OK to save changes. After disabling all the enhancements the problem should be resolved and your sound will start working again. Navigate to Advanced tab and in Exclusive Mode section disable Allow applications to take exclusive control of this device. Now click on Apply and OK to save changes. After disabling the Exclusive Mode the issue should be resolved completely. According to users, you can fix Failed to play sound test tone error message simply by running a troubleshooter. Sometimes there can be a glitch with your audio configuration that can cause this issue to appear. In the menu on the left select Troubleshoot. Now in the right pane select Playing Audio and click on Run the troubleshooter. Troubleshooter will now start. Wait while the troubleshooter fixes the problem. Press Windows Key + S and enter control panel. Choose Control Panel from the list. Select View all from the menu on the left. Now click on Playing Audio. Playing Audio troubleshooter will now open. Click on Next to start it. Once the troubleshooter is finished the problem should be resolved and your audio will start working. Both methods from above will perform the same troubleshooter, so feel free to use any of them. Many sound cards come with a dedicated software that offers various audio effects. Although these effects can sometimes improve your audio quality, they can often cause various problems to appear. According to users, Failed to play sound test tone error message is closely related to these sound effects, and in order to fix this problem, it’s strongly advised to disable them. To do that, simply open your audio configuration software, locate the Effects section and disable them all. After disabling all effects, check if the problem still appears. According to users, Failed to play sound test tone error message can appear due to certain Windows updates. Sometimes an update can have certain bugs and cause this problem to appear. Open the Settings app and go to Updates & security section. List of updates will now appear. Click on Uninstall updates. Now you should see recently installed updates. Double click a certain update in order to remove it. After you remove the recent updates check if the problem still appears. If not, it means that you found the cause of the problem. Now you just have to prevent the update from installing. To do that, simply download Show or hide updates troubleshooter, run it and prevent the problematic update from installing. After doing that, the update won’t be installed automatically and the issue won’t reappear. Press Windows Key + X to open Win + X menu. 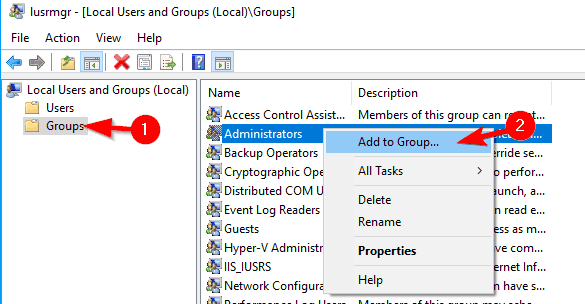 Choose Command Prompt (Admin) from the list. If Command Prompt isn’t available, feel free to use PowerShell (Admin) instead. When Command Prompt opens, enter sfc /scannow and press Enter to run it. SFC scan will now start. The scan can take about 10-15 minutes so don’t interrupt it. Now enter dism /online /cleanup-image /restorehealth and press Enter to run it. DISM scan will now start. This process can take about 15-20 minutes, so be sure not to interrupt it. Once the DISM scan is finished, check if the error still persists. If you couldn’t run SFC scan before, be sure to repeat it after performing a DISM scan. 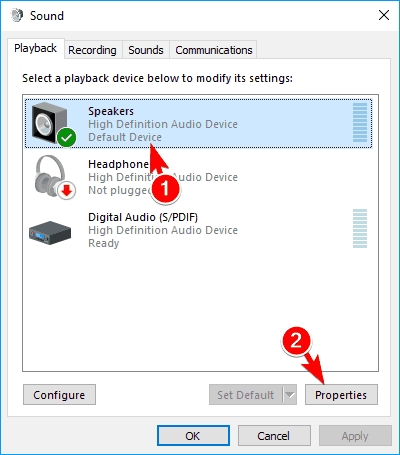 If you’re using USB headphones or speakers, you might encounter this problem due to other USB devices. According to users, they encountered Failed to play sound test tone error message because of Xbox 360 wireless gaming receiver. Many users use their Xbox 360 controller with their PC, and sometimes the wireless receiver can cause this problem to occur. To fix the issue, users are suggesting to disconnect the wireless receiver from your PC and restart it. Once your PC boots without the receiver, the sound should start working again. If the sound is working, you can reconnect your wireless receiver again. This is a simple workaround, and it works according to users, so feel free to try it. Keep in mind that you might have to repeat it if the issue reappears. Open the Sound window. You can do that by right clicking the sound icon in the bottom right corner and choosing Playback devices. 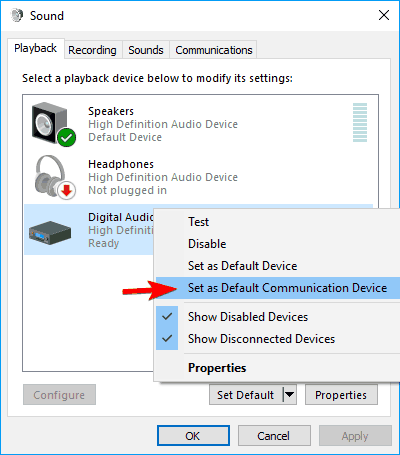 When the Sound window opens, right click any other device and choose Set as Default Communication Device. Now right click your audio device and choose Set as default. Repeat the same steps and select Set as Default Communication Device. After doing that, the problem should be fixed and your sound will start working. Now locate your audio device, right click it and choose Disable from the menu. Confirmation message will now appear. Click on Yes. You’ll be asked to restart your PC. Click on Yes to restart it now. 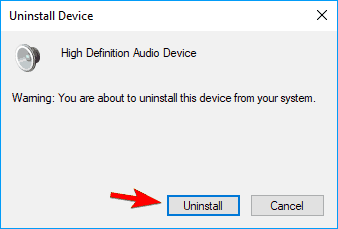 Once your PC restarts, go back to Device Manager, right click your audio device and choose Enable device from the menu. After disabling and enabling your audio device, the problem should be resolved. According to users, they experienced this issue while using a docking station on their laptop. Laptop docking stations can be incredibly useful since they provide you with additional ports, but sometimes issues with them can occur. Users reported that connecting their speakers or headphones to the docking station caused Failed to play sound test tone error message. According to users, you can fix the problem by connecting the speakers to the audio port on your laptop. After doing that, the issue will be resolved. As for the cause of the problem, your docking station might be faulty or it might not be fully compatible with your hardware or drivers. If you’re getting this error frequently, you might be able to fix it simply by changing your security permissions. To perform this solution, you’ll need to find another Windows 10 PC and compare the security permissions between the two. Optional: You might want to create a registry backup just in case. Modifying the registry can cause issues with your PC if you don’t modify it properly, so it’s advised to create a backup. To do that, click on File > Export. Now set All as Export range and enter the desired file name. Choose a safe location and click the Save button. After doing that, you’ll have a backup of your registry. 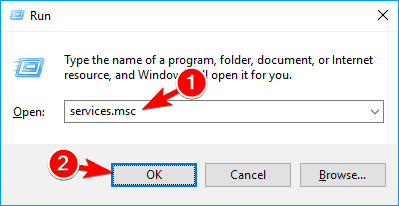 In case any problems occur after modifying the registry, you can simply run this file to restore the registry to the original state. In the left pane, navigate to HKEY_LOCAL_MACHINESOFTWAREMicrosoftWindowsCurrentVersionMMDevicesAudio. Right click the Audio key and choose Permissions from the menu. Repeat the same steps on a working PC. Now compare the list of entries in Group or user names sections on a working PC and on your PC. Check permissions for each entry on the list. 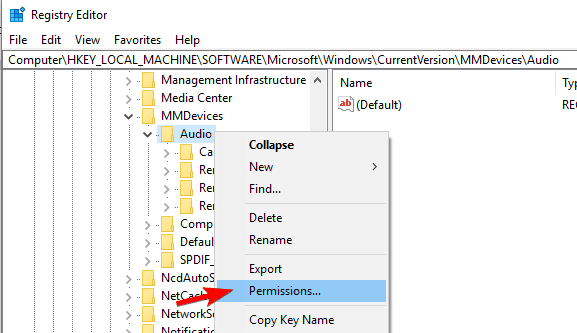 If certain entries or permissions are missing from your PC, you’ll need to readjust them. 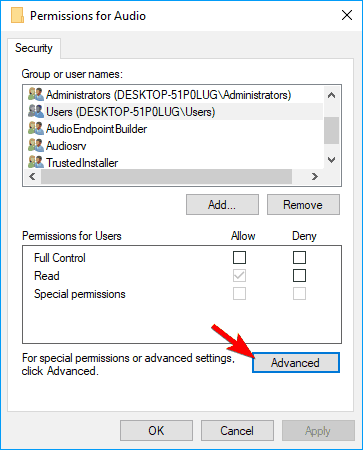 After all entries and permissions are the same on both PCs, click on Advanced. Check the Owner section on both PCs. If the owner section is different on the affected PC, be sure to change it accordingly. After the settings are the same on both PCs, check if the problem still appears. 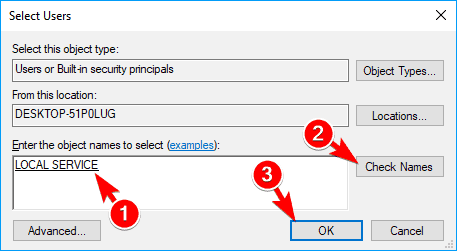 This is an advanced solution, so if you’re not familiar with security permissions or registry, you might want to skip it. Several users reported that adjusting their registry fixed the problem, so you might want to try that. According to users, Failed to play sound test tone error message can occur if you’re using a USB hub. USB hubs are useful, especially if you tend to use multiple USB devices. However, if you’re using a USB headphones, you might experience this problem with some gamepads. Users reported this problem while connecting both their gamepad and USB headphones to the same USB hub. It seems that some USB devices aren’t working properly together, so in order to fix it, you need to disconnect some of them. Users reported that disconnecting the gamepad from the USB hub fixes the issue for them, so you might want to try that. If that solves the problem, in the future you’ll need to connect your USB headphones first, and then connect the gamepad to the USB hub. This is a simple workaround, but users reported that it works, so feel free to try it out. In some cases your graphics card drivers can cause this problem to occur. According to users, certain graphics card drivers are also installing their audio drivers causing this problem to appear. To fix the issue, you need to uninstall your AMD driver and reinstall it. 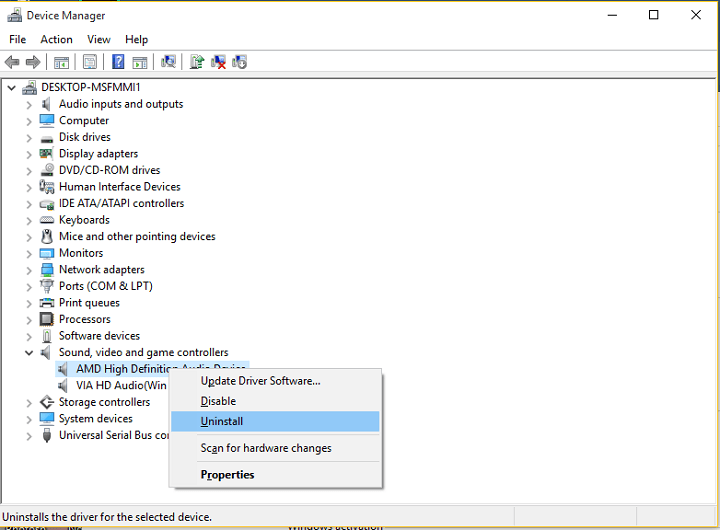 To completely remove a graphics card driver from your PC, many users are suggesting to use Display Driver Uninstaller. This is a free removal tool that will completely remove graphics card driver along with all its associated files. Once you remove the driver, you need to download the latest driver for your graphics card. While installing the driver, be sure to select Custom Installation option. 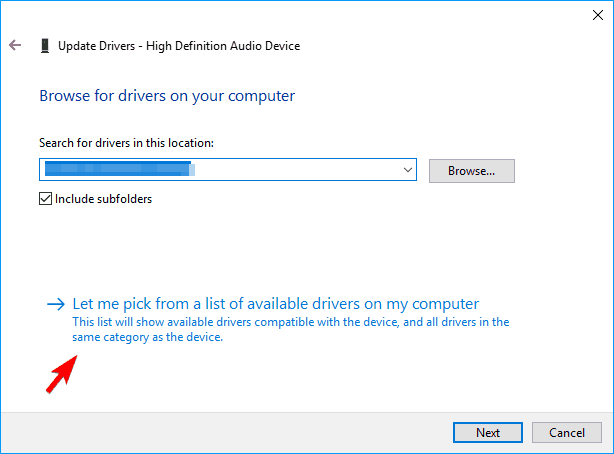 From there you’ll be able to choose which drivers you want to install. Be sure to deselect HDMI Audio Driver. After doing that, only the graphics card driver will be installed, and your problem should be fixed. Keep in mind that this issue can affect both AMD and Nvidia graphics cards, so be sure to try this solution even if you don’t use AMD graphics. Services window will now appear. 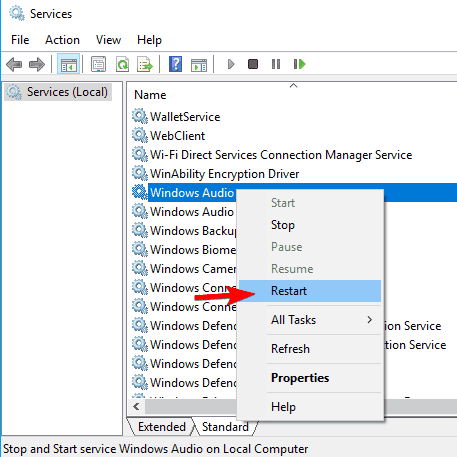 Locate Windows Audio service, right click it and choose Restart from the menu. 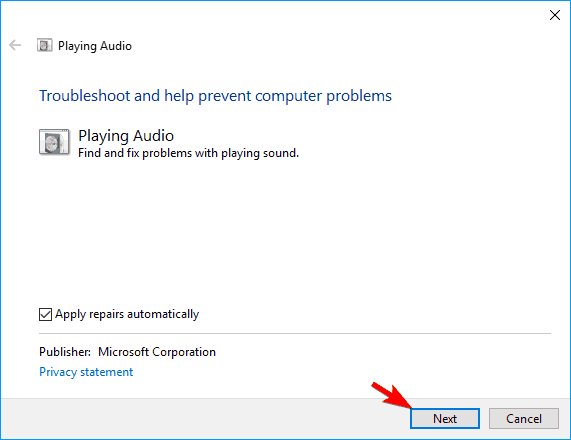 After Windows Audio service restarts, the problem should be resolved and your sound will start working again. Press Windows Key + R and enter lusrmgr.msc. Click on OK to press Enter. 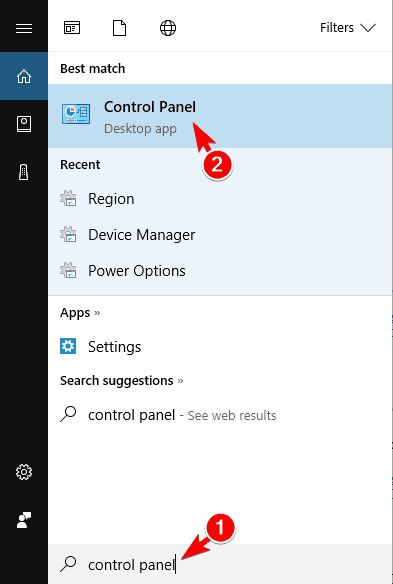 When Local Users and Groups window opens, click Groups in the left pane. 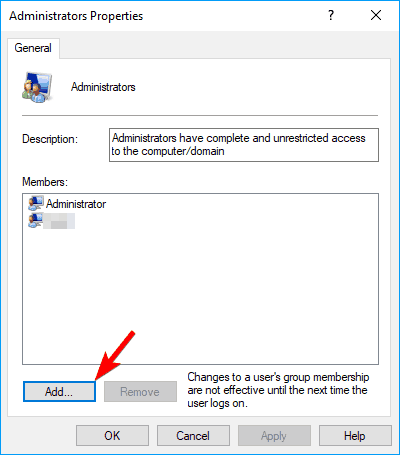 In the right pane, right click Administrators and choose Add to Group option from the menu. List of members will appear. Click on Add button. In the Enter the object names to select field enter Local Service. Click on Check Names button. 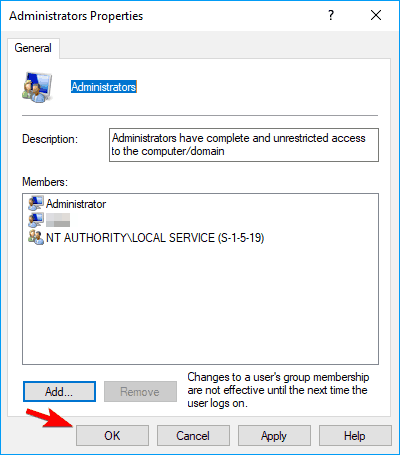 If everything is in order, click on OK.
NT AUTHORITY will now be added to the list of members. Click on Apply and OK to save changes. After making the changes, restart your PC and check if the problem is resolved. 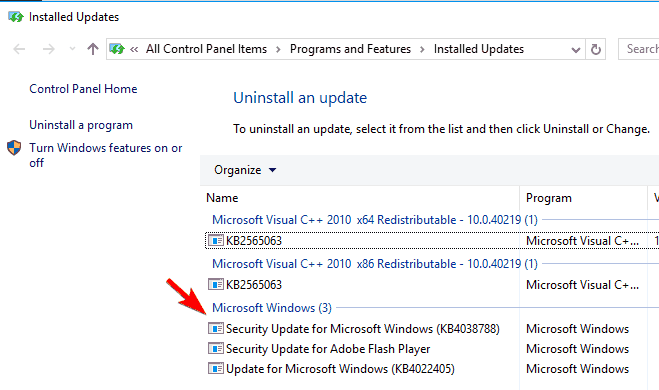 In the left pane, navigate to HKEY_LOCAL_MACHINESOFTWAREMicrosoftOle. 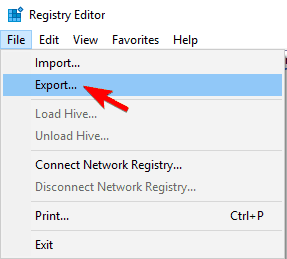 Right click Ole and choose Export from the menu. Make sure that Selected branch is selected in Export range section. Now enter the desired file name and click on Save. 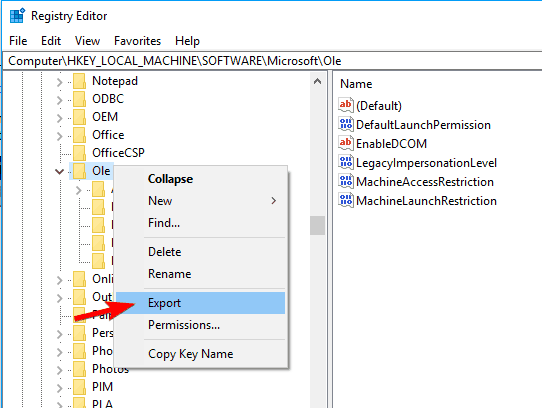 Locate DefaultLaunchPermission in the right pane, right click it and choose Delete. 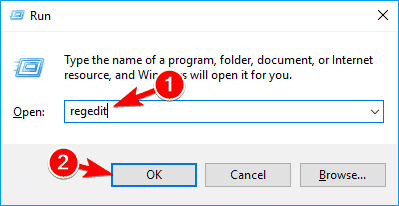 After deleting DefaultLaunchPermission entry, restart your PC. Once your PC restarts, check if the problem still appears. If not, you might want to restore DefaultLaunchPermission entry. To do that, simply run the file you created in Step 3. After doing that, your registry will be restored to original state. 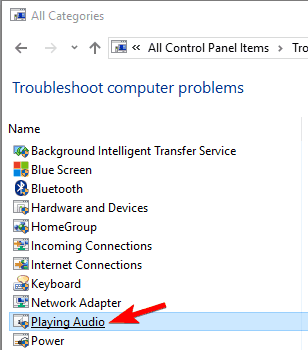 I hope this article helped you to solve the problem with playing sound test tone in Windows 10, but if these solutions don’t work for you, we recently wrote what to do if 5.1 channel surround sound isn’t working so you might want to check it out if you need more solutions. Also, if you have any comments, or questions, just write them down in the comments below.